Steve has a joke. That joke’s ability for laughter all depends on who is in the room. For example, if there are black people in the room, the joke might not go over very well. After all, it is a joke about black people. But if there are no black people in the room, why it just might be comic gold. 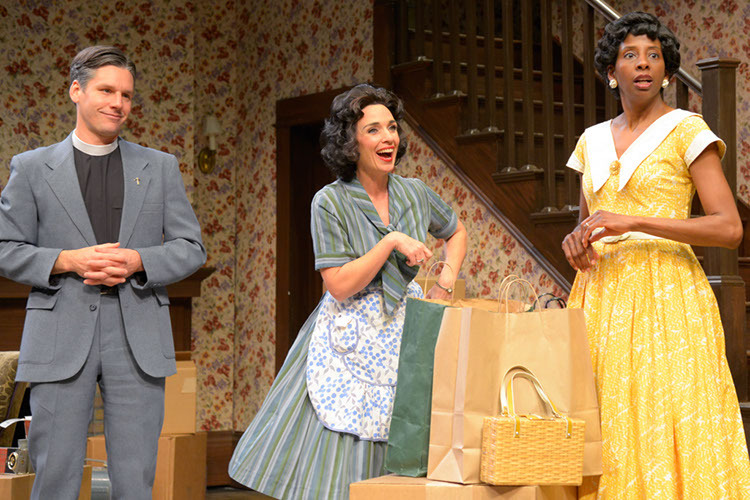 The discomfort and blatant hypocrisy just described is palpable truth in Bruce Norris’ exquisite “Clybourne Park,” with a wonderful production at Center REP in Walnut Creek. The play, Norris’ pièce de résistance that garnered him the Pulitzer Prize in 2011, connects to another legendary piece, Lorraine Hansberry’s “Raisin in the Sun.” Issues we as a society grapple with today when it comes to race and race relations are front and center in many explosive and downright cringe-worthy scenes. The play takes place in two acts, the first in 1959 and the second in 2009, with the first act taking place just after Karl Lindner (Craig Marker), the subtle bigot who attempts to buy the Younger’s new house in “Raisin,” comes from his infamous meeting with the Younger family. His concern has to do with having a “colored” family buy the home of Russ (Richard Howard) and Bev (Lynda DiVito) in their all-white neighborhood. Certainly in Karl’s mind, having a black family will potentially drive down property values and compromise the safety of his wife Betsy (Kendra Lee Oberhauser) and the unborn child she is carrying. Since he is not getting much in the way of cooperation from Russ and Bev, secrets of the house are used against them as veiled threats. Fast forward a half-century, and now the home that the Youngers lived in all those years is in a bad way. No longer does freshly pressed wallpaper adorn the walls. Now it is nice droplets of graffiti. Clybourne Park has become a predominantly black neighborhood, and now Steve and Lindsey (Marker and Oberhauser) are ready to do some renovating of their own. Ugliness takes over in a mostly powerful act two, save for a confusing and sometimes tedious exposition early on. This is where these moments become uncomfortable, but in the most effective way. What is most effective about Norris’ script is in its parallels. Characters in act one go around trying so hard not to be sensitive to cultures they know very little about, but come off so poorly as a result. While act one hangs its hat on milquetoast dialogue plucked directly from the Donna Reed show, it is fascinating to see how little things have changed 50 years later in act two in the way the characters communicate. One thing that is striking about the words is that no one ever seems to talk directly to anyone. Saying the characters are beating around the bush in this play is about as accurate as saying Joey Chestnut is a good little eater. These people beat around forests. Lindner is especially good at this, often speaking about black people as if they are not even in the room. Unfortunately, the dignified maid Francine (Velina Brown) and her husband Albert (Adrian Roberts), often stand stoically having to listen to Lindner spew his uninformed dreck. Norris’ script is highly skilled, a beautifully crafted tour-de-force that does many good things. I have seen two of his works produced by Steppenwolf Theatre in Chicago, “Purple Heart” and “We all Went Down to Amsterdam.” While those plays had a forcefully quirky quality to them, this piece showcases Norris’ high degree of difficulty, which is forgiving to the other flaws that exist in the script. With wonderful direction from artistic director Michael Butler of the phenomenal performers that make up the seven-member ensemble cast, sharp set design by J.B. Wilson and an effective costume plot by Elizabeth Poindexter, the production cohered sharply. The play’s denouement is certainly the most haunting and effective component, reminiscent of a histrionic ending often seen in works by Labute or Ibsen. While characters throughout the play make lots of noise, it’s not the noise that is important. Our blood, our desires, our tears and our dreams are shared with our fellow man. If we listened more and talked less, we may be better off. The Word: Norris’ script, at times plodding, is highly effective at tying together one of the great works of the American theatre with modern times.